We're just over a month away from Star Wars: The Force Awakens - I know, I can't believe it either - and despite several teasers, many mysteries still remain. Where's Luke? Will we see Hoth again? What do Stormtroopers eat for lunch? Also, what's Captain Phasma's deal? 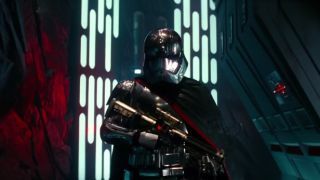 If you haven't already seen the talking action figure, you won't know what the character, played by Gwendoline Christie, sounds like. Phasma has popped up in the trailers but hasn't said a word. On the latest update to Sphero's BB8 toy, we get to hear her commands her troops around in a very British accent. What is it with Hollywood casting English people as the villains? Anyway, you can see the video below.